A crispy layer of bread crumbs adds an element of comfort food to this wonderfully simple vegetable casserole. Pre-baking the eggplant makes it creamy and soft, a beautiful contrast to the zucchini which retain a nice snappy bite. This dish is inspired by my participation in Share Our Strength’s Operation Frontline program, which is a free six week cooking and nutrition class geared to help low income people prepare and eat healthy meals on a very tight budget. This is a national program implemented by different organizations in every community. In Seattle, I volunteer through Solid Ground. Can cooking on a budget be delicious? Absolutely! One of the things I focus on in the classes I help teach is developing good cooking technique to draw the best flavor out of the ingredients. It’s hard to beat simple ingredients that are well cooked. It should be no surprise that my enthusiasm for the value of proper cooking technique comes from my experience with Rouxbe online cooking school. The concept of focusing on skills and technique rather than learning how to make a specific recipe really changed the way I cook, so this is how I approach the Operation Frontline classes. We made this casserole with a simple polenta the first week of class and talked about how to use a chef’s knife and different cutting techniques. I have shared a video demo from Rouxbe of cutting with a chef’s knife in a past post, so this time I’ll share the video demo of how to cut an onion which we practiced in the class this week. 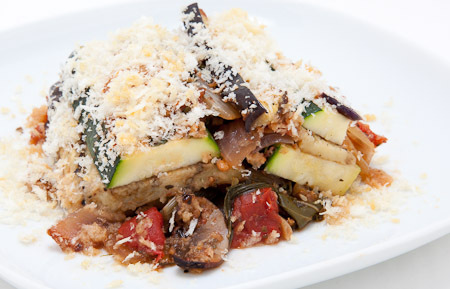 I love recipes that allow for creative license and the ratatouille gratin is very flexible giving you plenty of room to be creative. You can skip the mushrooms, use a mix of zucchini and yellow squash, double the Swiss chard, add in other veggies, or change the spices without any dire consequences. There are, however, a few key steps that will help to make the recipe successful. Slicing the eggplant and squash evenly is important so the pieces cook in the same amount of time. If the eggplant is too squirrely to make nice slices, trim a small slice off the middle of one side so it will sit securely on the cutting board. Give the onions enough time to sweat down over a medium-low heat to develop their flavor. If you hear a lot of sizzling in the pan and they are beginning to brown, turn the heat down. Taste the onion mixture before assembling the gratin to be sure it has enough seasoning. It should have a deep rich flavor and be on the strong side because it will be tempered by the eggplant and zucchini. In class we served this over a plain polenta, but here’s a more decadent version from Rouxbe if you feel like indulging. Please take advantage of the free 14-day Rouxbe membership to explore their site. Just click on any of the Rouxbe links from our site to access it. If you love it and want to purchase a membership, you will be helping us raise money for Share Our Strength. We are donating 100% of the commissions we make from membership sign-ups to Share Our Strength. This entry was posted on Thursday, August 5th, 2010 at 11:28 am	and is filed under Cooking on a budget, Operation Frontline, Rouxbe.com. You can follow any responses to this entry through the RSS 2.0 feed. You can leave a response, or trackback from your own site. What a fabulous version of Ratatouille that would even make a mouse named Remy smile with delight. Thank you so much for the plug about Operation Frontline! We’re glad you’re enjoying volunteering and our ratatouille! Steve – I think I was channeling Remy as I made this! Emily – Operation Frontline rocks! I’ve found varied ingredients, but generally yours is the healthiest with chard, lowest fat, and great herb selection. In summer I wil use fresh plum tomatoes, and a touch of bell peppers.